1. Place the butter in the bowl of a mixer fitted with a whisk attachment. Whisk for approximately 10 minutes on high speed, until light in colour and double in volume. You will need to scrape the side of the bowl a couple of times during the whisking. 2. Add the almond extract and whisk for an additional minute. Decant into a bowl and keep in the fridge until ready to serve. 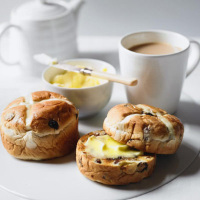 Heston from Waitrose Earl Grey & Mandarin Hot Cross Buns, £1.59/2s, are studded with Earl Grey-soaked raisins and candied mandarin pieces.